Asakusa (浅草) is a part of Tokyo's downtown Taito district best known for its many temples, particularly Sensōji. 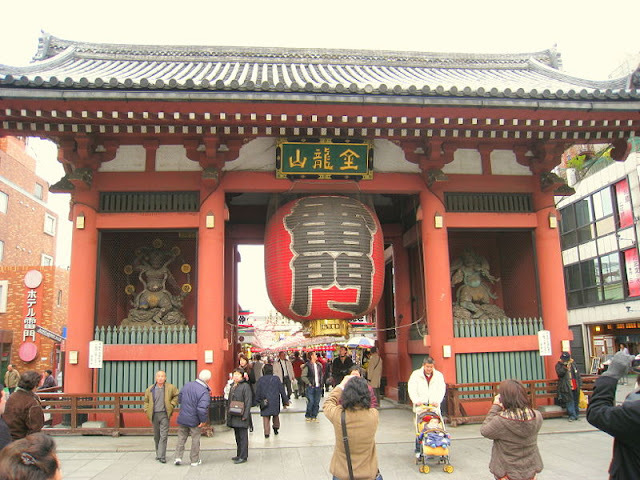 The gate, with its lantern and statues, is popular with tourists.The Kaminarimon (雷門 "Thunder Gate") is the outer of two large entrance gates that ultimately leads to the Senso-ji (the inner being the Hozomon) in Asakusa, Tokyo, Japan. The gate, with its lantern and statues, is popular with tourists. It stands 11.7 m tall, 11.4 m wide and covers and area of 69.3 m2. The Kaminarimon was first built in 942 by Taira no Kinmasa. It was originally located near Komagata, but it was reconstructed in its current location in 1635. 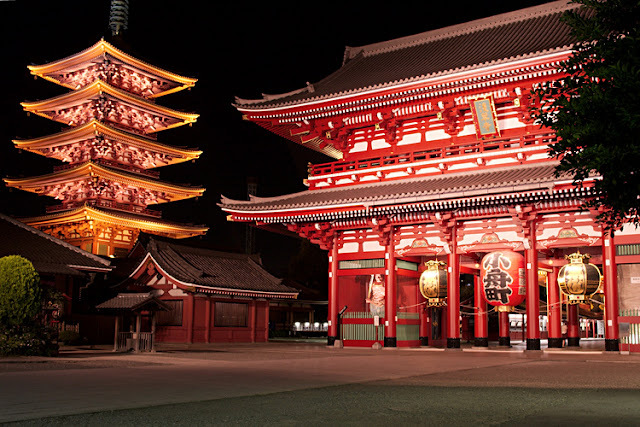 This is believed to be when the statues of Raijin and Fūjin were first placed on the gate. The gate has been destroyed many times throughout the ages. Four years after its relocation, the Kaminarimon burned down, and in 1649 Tokugawa Iemitsu rebuilt the gate along with several other of the major structures in the temple complex. The Kaminarimon's current structure dates from 1960. Four statues are housed in the Kaminarimon. On the front of the gate, the statues of the Shinto gods Fujin and Raijin are displayed. Fūjin, literally the god of wind, is located on the east side of the gate, while Raijin, literally the god of thunder, is located on the west side. Two additional statues stand on the reverse of the gate: the Buddhist god Tenryū on the east, and the goddess Kinryū on the west side. 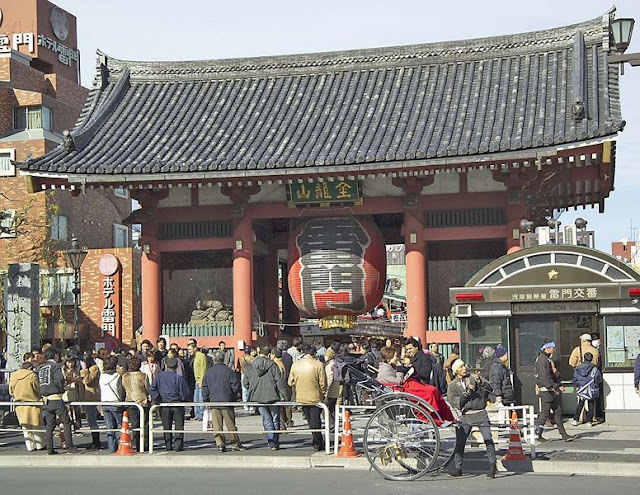 In the center of the Kaminarimon, under the gate, hangs a giant red chochin that is 4 meters tall, 3.4 meters in circumference and weighs 670 kilograms (1,500 lb). Being very fragile, the lantern is not an original piece. It is instead a restoration that was donated in August 2003 in commemoration of the 400th anniversary of the start of the Edo period by Konosuke Matsushita, the founder of the Matsushita Electric Industrial Co. (now known as Panasonic). The front of the lantern displays the gate's name, Kaminarimon (雷門). Painted on the back is the gate’s official name, Furaijinmon (風雷神門). A wooden carving depicting a dragon adorns the bottom of the lantern. 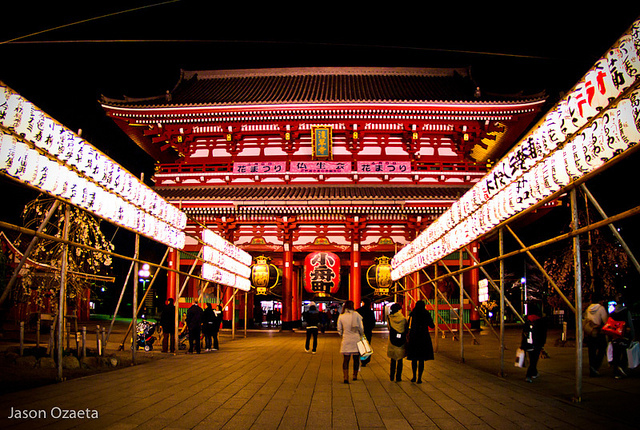 During festivals such as Sanja Matsurii, the lantern is collapsed to let tall objects pass through the gate. The characters 金龍山 (Kinryū-zan) on the tablet above the lantern read from right to left and reference the Sensō-ji. Sanja Matsuri (三社祭). Organized at Asakusa Jinja yearly on the third weekend in May, this is Tokyo's largest festival (matsuri) and attracts up to 2 million spectators. The main event is a procession known as Daigyoretsu, when traditional performers and musicians parade through the streets, while on the next two days portable shrines (mikoshi) are carried to and from the temple for purification. Asakusa Samba Carnival. Held on the last Saturday of August. The street parade, which features thousands of participants from all over Japan, is held in the afternoon around Sensoji, and there are some stage shows in the evening. The event started in 1981, it's the biggest party of the year for the many Japanese-Brazilian residents of Tokyo. Hanayashiki (花やしき). Next to the Sensoji temple grounds is this small and somewhat lackluster carnival complex with rides, booths, and games. The neighborhood theatre specializes in showing classic Japanese films, as many of the tourists are elderly Japanese. 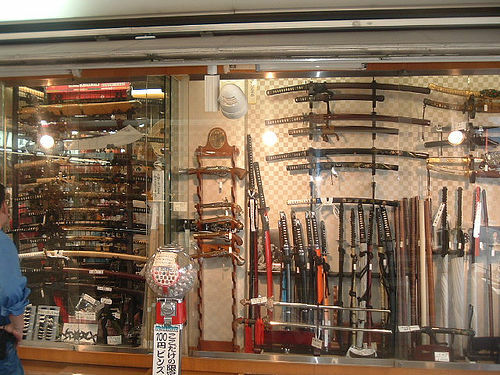 The shops are tourist friendly. 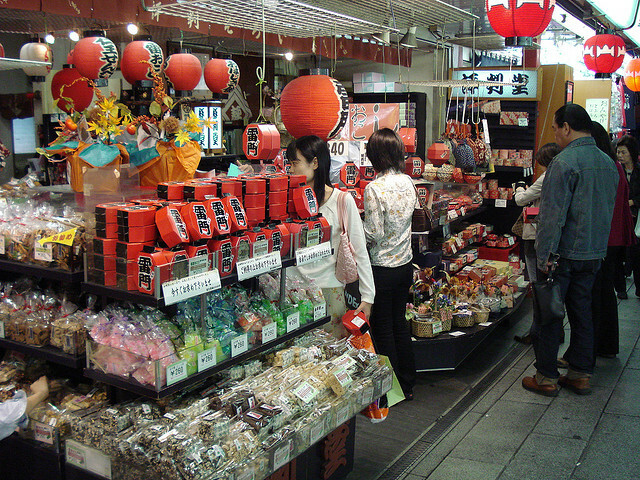 Even if you don't really speak Japanese, the shopkeeper will calculate the amount using a calculator and show it to you, a rather convenient way to communicate about the price. 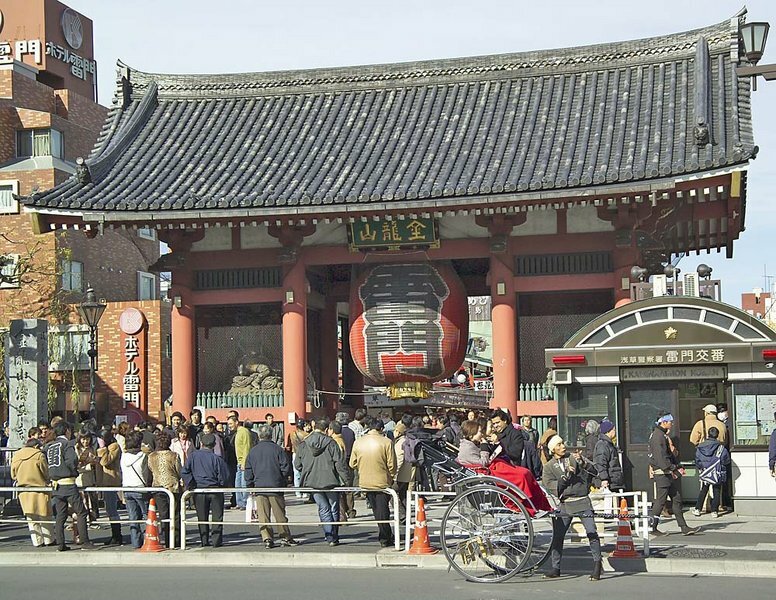 Asakusa is definitely a must-visit place for all tourist. 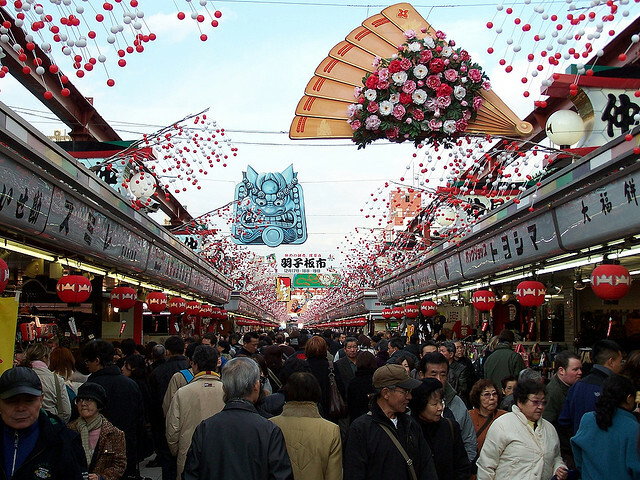 Asakusa is also a popular accommodation choice for budget travelers and there are many cheap ryokan catering to foreigners in the area..